If you are looking to increase your professional knowledge and skills to enable you and the museums that you lead or support to flourish in 2017, then make sure you apply for the AIM Hallmarks Leaders and Enablers Programme which is now open for applications. You might be a Museum Director who wants to build a supportive network of peers facing similar challenges – or to share ideas – or perhaps you are a Museum Development Officer or Consultant looking to extend your range of tools to resolve dilemmas and address complex issues. Whatever your role, the range of practical tools, ongoing support and new networks will inspire you with new ideas and enhance your confidence. The AIM Hallmarks Learning Programme has been developed to address the needs of those who lead or support museums and is delivered on behalf of AIM by Ruth Lesirge and Hilary Barnard: highly experienced consultants with a strong track record of supporting chief executives from across the voluntary sector. The learning programme is delivered over a series of short residentials to make it as easy as possible to fit in around work and personal commitments and participants in Round 1 commented that they appreciated the flexibility of the programme. Each residential features expert guest speakers; usually one from the museum sector and one from the broader voluntary sector to offer a rich range of perspectives and we will be announcing our 2017 schedule of speakers very soon. There are 12 places on each of the programmes for people working in or for museums in England, supported by Arts Council England. There are 2 places for museum leaders working in Scotland, Wales or Northern Ireland, supported by AIM. If you work in a museum development role in Scotland, Wales or Northern Ireland and are interested in the Enablers programme, please contact us to discuss the possibility of a self-funded place. What attitudes, behaviours and skills are needed to ensure a thriving workforce in the museum and heritage sector over the next decade? A research report published earlier this week has found that professional and personal development should be a priority for the sector and that better resources are needed to enable this to happen. A summary of this report can be found here: Character Matters attitudes, behaviours and skills in the UK Museum workforce. The Museums Workforce Research was commissioned by Arts Council England, together with the Association of Independent Museums, Museums Galleries Scotland and the Museums Association. The research included evidence based on 2000 online survey responses, interviews and consultations carried out by BOP Consulting with the Museum Consultancy and has highlighted 30 recommendations that focus on recruitment, skills and CPD, organisational and sector development. AIM has welcomed this research, in particular the need for better business skills to support income generation. AIM members already excel at increasing their own income in a way that complements rather than conflicts with their core purpose and AIM Success Guides such as Successful Retailing for Smaller Museums and Successful Business Planning can help strengthen skills in this area. The research also highlighted the need for development opportunities for boards and trustees. AIM has recognised the need for support for trustees’ development for some time, and we are able to offer opportunities in this area through the AIM Hallmarks Governance Programme. Character Matters attitudes, behaviours and skills in the UK Museum workforce. Full Report: Character Matters attitudes, behaviours and skills in the UK Museum workforce. What is a resilient museum? What can museums do as buildings, social spaces, and cultural institutions to embody sustainable practice – environmentally, socially and economically? This webinar is designed to provide a holistic overview of sustainability within museums and will include examples from the sector and transferable actions for improvement. Lucy Latham, Environmental Sustainability Coordinator at Julie’s Bicycle will be joined by Hilary Jennings, Director of the Happy Museum Project. Culture24 are running two free workshops open to all staff and volunteers from museums, galleries, libraries, archives and heritage sites interested in taking part in Museums at Night. The Impact of Sporting Heritage will explore the role and value of sporting collections, offer ideas about how to measure your impact, focus on different agendas supported by sporting heritage such as health and wellbeing and education and provide a range of case study examples. Places are subsidised and cost just £25. Bookings close on the 4th February 2016. This free course is provided by the Welsh Government and is open to staff and volunteers working in museums in Wales. It is suitable for those who want to develop a greater understanding of statistics and how they can be used by museums for evidence and advocacy. Run by Jonathan Durnin from DC Research, this is a half day course and training will begin at 13:30. Organised by the Royal Commission on the Ancient and Historical Monuments of Wales, Digital Past is an annual two-day conference which showcases innovative digital technologies and techniques for data capture, interpretation and dissemination of the heritage of Wales, the UK and beyond. Bringing together individuals from the commercial, public, academic, third sector and voluntary sectors, the conference aims to promote learning, discussion and debate around a range of digital technologies in current use, or in development, to record and understand the historic environment. Registration cost for the two days is £89, including lunch and refreshments on both days. Having a proactive and fully engaged board of Trustees is a valuable asset for any museum, no matter what its size. In the recently published AIM Hallmarks of Prospering Museums, Governance is featured as a key characteristic, so to help your board gain confidence in their roles, we have gathered together some upcoming training opportunities and other information that that may be helpful for your Trustees. The reputation of the sector has been under intense pressure in recent weeks, so this is a timely briefing from specialist law firm Harbottle & Lewis. Do you feel charity finance is a dark art? Is this something you’re perhaps too happy to leave to your finance or audit committee? Or do you just need a refresher? This workshop is aimed at Trustees, CEOs and charity managers. This course draws on NCVO’s cutting-edge thinking that has been developed from our governance work with a range of charities over many years, to ensure that your trustees and staff relationships go from strength to strength. This course enables participants to cost the services provided by their organisation, and to produce and monitor budgets and cash flows. This session will deal with; developing appropriate governance arrangements; negotiating the nature and parameters of the partnership; considering the relationship between organisations; legal issues in working in partnership. A half-day seminar to help new board members (and those who would like a refresher) to understand their roles and responsibilities. Topics covered include the new accreditation requirements for the Forward Plan, a documentation plan and a collections care and conservation plan. The day will include practical exercises to help participants review and report against their plans. If you know of any other training opportunities that would be suitable for AIM members that we have not covered here, please email sassy@aim-museums.co.uk and we will add them to this list. Museums Galleries Scotland runs the National Skills Development Programme which is a ‘one stop shop’ for a broad range of skills development activities. This includes activities supported and delivered both by MGS and partner organisations with a national remit. Upcoming courses include topics such as Accreditation, Collections Development, Digital, Partnership Working and Copyright and Digitisation. Why don’t objects last for ever? Why does it matter where watercolours are displayed? Why is it necessary to wear gloves to handle objects? If you have ever wondered why collections care matters – or even what it is – then this is the workshop for you. Workshop Tutor, Jane Thompson Webb, will show you what the main agents of decay are and how they can damage objects. You will also be offered a range of practical strategies to help ensure that your collections will be accessible now and in the future. Each workshop runs from 10am – 4.30pm and delegate packs with useful conservation items and lunch/refreshments will be provided. At the end of the workshop, participants will be able to spot the causes of damage in their own collections and introduce monitoring and/or mitigation strategies. Taking part in collections care workshops is also a lot of fun and a great opportunity to get up close to some interesting objects! 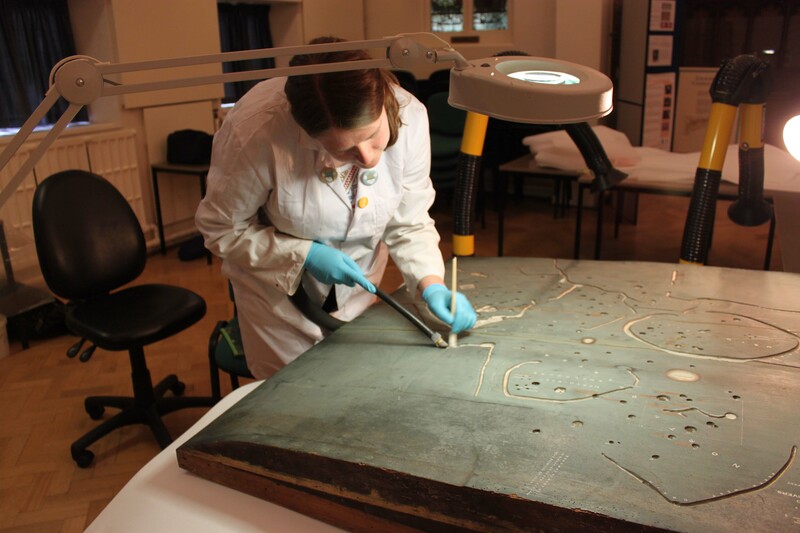 If you work or volunteer in a museum, this workshop will give you a greater understanding of caring for your collections, why objects deteriorate and what practical steps you can take to limit damage. Booking early is advisable with 20 places available at each workshop. Thank you to the Trustees Week Newsletter for information about these two events for Trustees in Scotland in November. Trustees Week is 10-16 November 2014 across the UK. It will be launched with a conference in London on 10th November. The Scottish Council for Voluntary Organisations (SCVO) is holding a Trustees Network Conference, to provide a unique learning and networking opportunity trustees from charities, community groups, social enterprises and voluntary organisations of all shapes and sizes. The conference will help trustees to develop their knowledge and understanding of governance, and make new connections to assist them in their roles. For more information about conference content, and to book, click HERE. The early bird rate ends on 30th September! Targeted at past, present and future trustees, this conference is an opportunity to share Scotland’s collective experience of working as, and with, trustees, highlight the great work that trustees are currently doing and present opportunities for people from all walks of life to get involved and make a difference. In honour of the vital role charity trustees play, Scotland’s Third Sector Leadership Forum is proud to present this flagship event celebrating their work across the country. To book, or for more details on the agenda and discussion topics, as well as on location and parking, click HERE. This is a free event with lunch provided. Giving to Heritage is an HLF catalyst funded programme in England to support heritage organisations with their fundraising. There is information about similar programmes in Wales or Scotland. In England, Giving To Heritage are looking for fundraising mentors and mentees for a free programme. Training is provided. You can download a mentor/mentee application form. The deadline for all applications is 13thOctober 2014. They also have a few more spaces on 1:1 support and consultancy sessions lasting one hour. The aim of the sessions is to assist people at all levels of heritage fundraising through support and guidance from a fundraising expert.